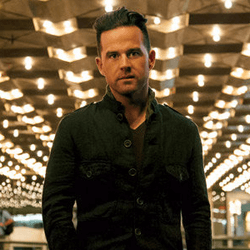 To help tell the story of Fighter, the most personal album David Nail has written, the GRAMMY-nominated singer/songwriter has unveiled an emotional and poignant Fighter video series encompassing six episodes total. Fighter is an ode to David’s wife Catherine given her “fight” through David’s battle with depression as well as their struggle as a couple with infertility which was recently highlighted in, The Tennessean. Other featured fighters in the video series include former NFL linebacker Tim Shaw who was diagnosed with ALS, widowed Army wife Crissie Carpenter, and former addict Brenda Wilson. The goal of the series is to allow others to share their Fighter story alongside David and Catherine’s as well as amplify the message of success against seemingly unfamiliar odds. Fans can view all six videos and submit their own personal Fighter story HERE. For additional information on the fighters and their corresponding charities, click HERE. Co-penned by Brothers Osborne with Troy Verges and Barry Dean, “Good at Tonight” joins a lineup that includes seven tunes written or co-written by Nail. Fighter will be released July 15th. Click HERE to hear a portion of the song and to read the full story. Artists featured on Fighter include Brothers Osborne on “Good at Tonight” (they also co-wrote the song), Lori McKenna on “Home” (she has a co-writing credit on the tune), Vince Gill on “I Won’t Let You Go,” Logan Brill on “Champagne Promise” and Bear and Bo Rinehart of NeedToBreathe on “Old Man’s Symphony.” Chris Stapleton co-wrote “Ease Your Pain,” though he does not appear on the song himself. Fighter is scheduled to drop July 15. It is available for pre-order on Nail’s official website. Read the full story, click HERE. Fans share their Fighter story alongside David and Catherine’s. The goal of the Fighter series is to inspire and amplify the message of success against seemingly unfair odds. Additional videos can be viewed HERE and fans can submit their own Fighter stories HERE.